What science branch does this best represent? I’m thinking physics (fusion and lasers and the like). Thoughts? Testing this headband out. Think I want it a bit thinner. So much more comfy than store bought ones. 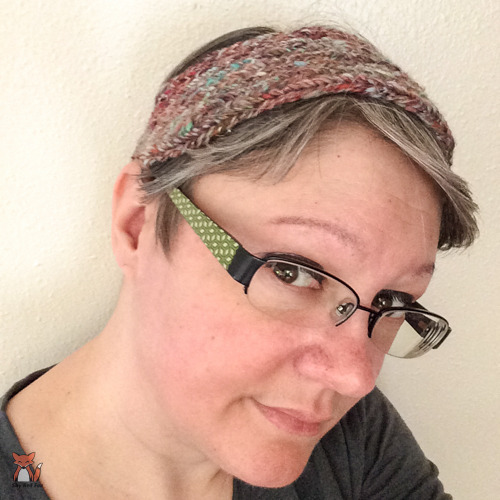 Any interest in a headband pattern? I think the only thing I knit anymore is socks. Any other obsessive sock knitters out there? What craft do you want to learn? Spun last night for myself: Finn. Amazing for bulky singles. I want to spin more of this! Have you spun Finn wool? Added a new class to my schedule. Green Camel Gathering (Tyler, MN) – Beginning Nalbinding. 9am-noon. With the new yarns coming in, I can’t wait to hit the dyepot! I’m carrying some American grown and made yarns now. (This is something I’ve been working toward. It’s important to me to support the wool industry in my own country.) Also, I’m only carrying one superwash yarn (for socks – obvious reasons) due to concerns I have over the effects on the environment and superwash treatments almost all being done overseas. * Any colorways or bases you’d like to see dyed? * Any suggestions for colors you’d like to see? My sweater is coming along. Look I have the start to sleeves!